Green Pool Maintenance Tip #1: Scrub-A-Dub-Dub! Before adding any chemicals or cleaning products to your pool, the sides and bottom of the pool must be scrubbed down. Algae loves to cling to surfaces, so use a wire brush on plaster pools or a nylon scrub brush on vinyl pools to break it up. This will allow the chemicals to work faster and better. After a scrub, be sure to vacuum the bottom of the pool and run the filters. In some instances, running the filtration system for 24 hours after scrubbing the pool will completely eliminate green pool water. A shock with 70% available chlorine should be able to completely wipe out algae and clear up your green waters. 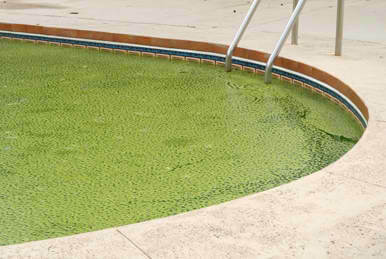 Depending on how much algae has built up in the pool, you may need to repeat the shock process more than once. After your chlorine levels are 5.0 or lower, treat your pool with an agaecide and allow it to do its job for at least a full 24 hours. Then be sure to clean your filter by spraying it down with your hose to remove any dead algae (this will prevent pressure buildup). A pH level that’s off balance will almost always result in green water as a pH that’s too low or too high creates an environment where the other chemicals, like chlorine, aren’t able to do their job and properly clean and sanitize your pool. Sodium carbonate can be used to increase the pH, or sodium bisulfate can be used to decrease it, so that the pH levels are within the 7.0 to 7.4 range.